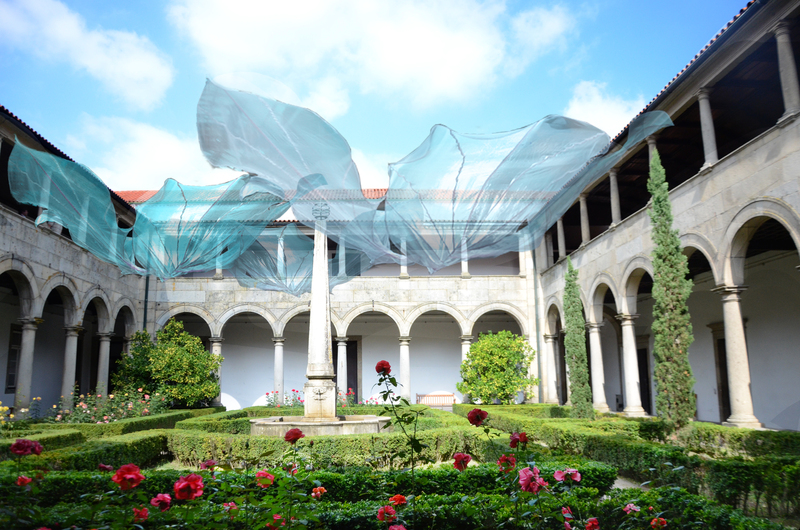 In her reflections upon the residency undertaken two artists for Contextile 2018, the textile art biennale, which took place in Guimarães, Portugal from 1 September to 20 October 2018 (www.contextile.pt), Darina Alster examines amongst other things the possibilities of relationships that contemporary art might establish with local traditions and the specific social roles they embody. Textile art is a domain in which there is often a social, physical or gender context, as well as many other local, national or ethnic links implicitly present thanks to a host of specific roles that textiles traditionally played and still do in many societies. In this respect, the work of the two artists with the local women’s community raises a host of questions. 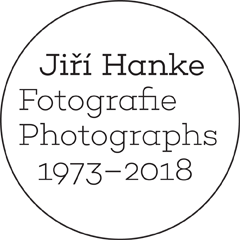 These start with the positive contribution involved in reviving a dying tradition and a closed female micro-world by means of contemporary art practice, and ends with the question of whether such activities can genuinely help over the long-term horizon, or whether they represent simply the musealisation of a dying art within the context of a monotonous globalisation. Guimarães is a picturesque provincial town in Portugal around fifty kilometres from Porto. Preparations for the Contextile biennale are fully underway. In the early hours of Friday 20 July, we visited a folk market where they sell flowers, fruit, confectionary, salt cod (Bacalaoi) and live hens. Around the corner from the marketplace in an unobtrusive location are large stone vessels containing water. A group of local women are washing clothes in them, chatting and singing. They form a women’s circle. Both old and young are washing huge pieces of textile, rugs, mattresses, etc., that cannot be washed at home in automatic washing machines. In 2012, Guimarães was made a European city of Culture and local organisations used the funds provided to convert a small factory into what is now the Casa de la Memoría cultural centre. This was also the first year that the first Contextile biennale took place. The Casa de la Memoría, i.e. House of Memories, is a museum exhibition focusing on the town’s memory. The exhibition is divided into two parts reflecting the themes of territory(place) and community(people). The themes are charted using playful multimedia installations, and the entire exhibition has the feel of a contemporary artwork. Cláudia Melo, the curator of the international project Magic Carpets, which is part of the Contextile Biennial, is originally an artist. However, in recent years she has focused on curatorship. Since 2013, upon the instigation of the Guimarães city authorities, she has been leading a project aimed at preserving the original form of the town in the face of an influx of tourists. She has always been interested in the theme of community and the local context. Magic Carpets is her first international project. Ida Blažičko laid the foundations of her work with the old women washing clothes. She spent a lot of time visiting them, chatting to them, asking them if she could conduct interviews, filming, etc. She brought them little flour-leafed clovers that she found in the grass nearby, gifts, drew them and showed them the sketches of her projects… The women got used to her presence and accepted her. They welcomed her into their circle and have become best friends. They sing, laugh and cry together, and help each other with the washing. Hermione Allsopp was interested in the performative element of collective washing. She used the cement and stone from which the washing basins or lavoirs are made as the materials for her installation. She interpreted the cyclical process of the movement of washing by means of sculpture and installation. Her sculptural work captured the materiality of textiles. 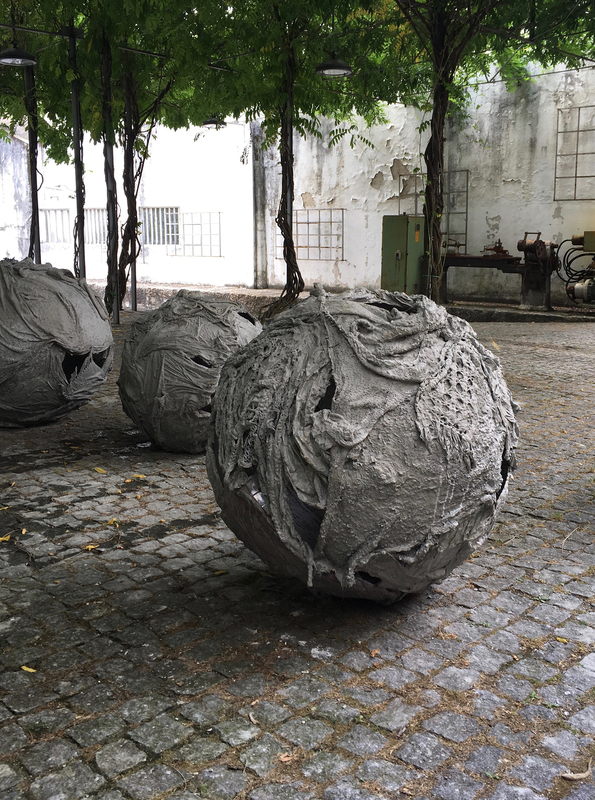 She created balls of textile impregnated with cement that became the embodied movements of washing and a paraphrase of the cyclicality of the entire process. The spheres are hollow, fragile, like the stories of the old women. Ida Blažičko recorded the sounds, conversations and singing of the women and created audio installations. She created forms from fabrics that reflect upon the time and memories concealed in textiles. She played her audiovisual installations in the lavoirs. She observed the women as they recounted stories of their lives and fears while washing, often giving vent to very personal themes that would not otherwise be nurtured by another environment. When cleaning these bulky textiles the women are in fact cleansing their own interior worlds. The lavoirs represent a kind of safe space where they are able to put aside their family duties and speak openly about whatever they want. Grannies do their washing alongside their granddaughters. Mothers explain the sensitive topics of women’s cycles and sexuality to their daughters. For many women the time spent at the communal basins is the only moment they feel free. These are intergenerational women’s circles with a tradition stretching far back into the mists of time. They meet every Thursday and Friday. Many people from Guimarãeswork in the local textile factories. These are mainly men: the women tend to remain at home. Young people do not tend to use the lavoirs. They live according to a different rhythm, they do not need tradition or community, and this is why many of the traditional washing points are disappearing from the city. “We washed our laundry along with the local women. I have to say that it is no easy job washing huge textiles by hand. You need a lot of strength. In my work I am particularly interested in biometrics, i.e. learning from natural processes, and morphotex, i.e. textiles that are coloured by means of their structure and not using dye. I am interested in the dematerialisation of material, the visualisation of air and the surface of water. For Contextile I am creating an audio installation. I’m recording the women as they sing. I want to return their presence to the city centre and revive their sounds and traces to places where they have been wiped out by tourism. The lavoirs have been removed from the centre of Guimarães. I work with sounds and organza (a type of fabric) that I have prepared along with the women. They helped me wash the huge mass of fabric because they saw that I could not do it on my own,”Blažičko says. Hermione Allsopp is building her sculpture in the garden of the Casa de la Memoría. She is inspired by the drapery of large pieces of fabric and the play of light in the water of the lavoirs. The gestural aspect of washing, the power of the laundry press, the relationship with water and the weather… The process of washing is very physical. Handling the heavy saturated fabrics needs a lot of strength. She is also fascinated by the intimate relationships and the cyclicality of movement of the women washing their laundry in the basins. I asked Hermione to describe how she set about working on the project: “There’s a saying in English: Don’t wash your dirty laundry in public! Textiles and clothes are filled with symbolic value. They bear witness to our bodies, relationships and environments. Textiles are a map of our memories.”Hermione wants to capture these memories and to become part of the life of the local women. She is interested in laundry as material. Her project is called Organic Matters. 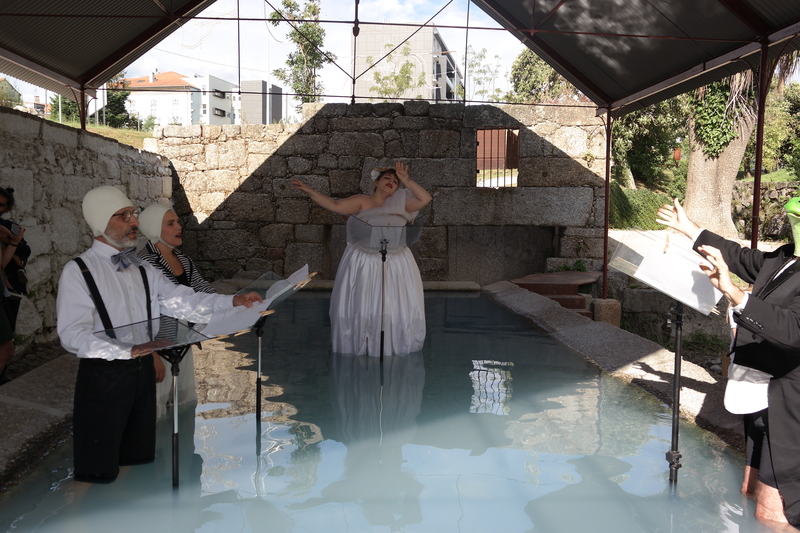 The residency of Ida Blažičko and Hermione Allsopp lasted three months and the outcomes of their work were included in the Bienalle Contextille in Guimarães. Cláudia Melo’s curatorial project recounts the city’s memory, its metamorphosing traditions and places. The behaviour of the local women can justifiably be called a tradition. The gradual disappearance of traditions is a sign of the gradual loss of the collective identity. Cities are beginning to resemble each other and are losing their genius loci. Artworks incorporating these traditions remind us of this spirit and help preserve the local customs for future generations. The Casa de la Memoría is a reconstruction of the memory of the city of Guimarães. This conceptually flavored exhibition tells of the local customs of its inhabitants as well as of the deconstruction of memory as such. “The lavoirs represent a heterotopical place, a place of freedom for women within a traditional patriarchal society,” adds curator Cláudia Melo. “The strategy pursued by Contextile Biennial is to connect up territories and people and to recreate old trades such as textile production, which has a long tradition in this region. This is for us a hugely important way of capturing and preserving memories by placing traditional textiles within the context of contemporary art. We thus assist in the creation of self-confidence using themes of identity, territory and memory. The first two biennales took place in Casa de la Memoría. This year Contextile is more international. Around eighty artists from around the world are exhibiting. The star of the entire biennale is the English artist Ann Hamilton,” says Joaquin Pinheiro, main curator of the biennale. On Thursday and Friday the water is changed at the lavoirs and the women begin washing in the early hours of the morning. The artists mingle with them, influencing their everyday life by following them. The aroma of soap, laundry and freshly cut grass reminds one of childhood. The two artists are gradually becoming an integral part of the everyday life of these women. When they leave, the women will have a story to tell over their washing. From an aesthetic perspective, the old tradition of washing laundry in public has acquired symbolic significance. The question remains whether the context of contemporary art has contributed to improving the quality of the everyday lives of these local women.